With five children aged 12 to 20 under her care, single mother Siti Aidah Abdullah rarely has a say in what food she and her children eat. The 48-year-old, who has Stage 4 leukaemia, is on government assistance and relies on food donations, which typically comprise dry foods such as canned food and noodles. "My children eat whatever food donations are given, like biscuits and Maggi (noodles)," she said. "Sometimes, when my son has no food to eat, he eats his fingernails." Yesterday, Madam Siti, who used to work as a trolley service staff member at Changi Airport, was one of 500 beneficiaries who were given the chance to shop and choose $50 worth of their own fresh produce - including seafood, poultry, fruit and vegetables - to take home. 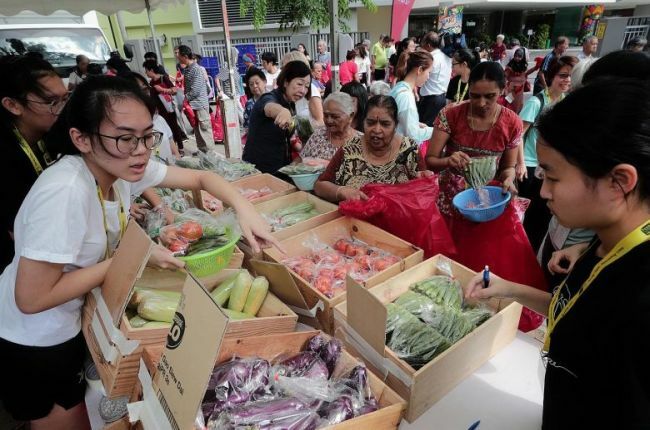 Food from the Heart, a charity that feeds the needy in Singapore, organised its first Pop-Up Fresh Produce Market outside Teck Ghee Community Club. The charity's chief executive Sim Bee Hia said: "The Pop-Up Fresh Produce Market is a new initiative, as we focus on changing perceptions around the food programmes for the needy, and better empowering our beneficiaries with choices when receiving food aid. "We hope to change the way Singapore looks at serving and giving to the community. In addition, this market also allows our beneficiaries to select the items that are truly relevant to their needs, while adding fresh produce and nutrition into the mix of food items that they use to prepare their meals." Ms Ernie Lydia Abu Yamin, a social work assistant at Ang Mo Kio Family Service Centre, said: "Fresh seafood and poultry are pricier grocery items that our beneficiaries don't often buy for themselves. So when they learnt that they will be able to select and take home fresh ingredients that include meat items, they were really happy." Last week, the Health Promotion Board launched a pilot scheme to help lower-income groups eat more healthily. It includes guidelines for donors on picking healthier food products for beneficiaries. Beneficiary Kok Ya Sia, 85, said: "It is a nice thought to let us choose our own groceries. The volunteers were also quite helpful because they helped me carry the bag of food, which was quite heavy for elderly people." The market is expected to benefit about 1,500 people. The charity aims to hold its next pop-up in May before reviewing its sustainability. As for Madam Siti, she took home vegetables, chicken, fish, prawns and noodles. "I do not have the money to go to the supermarket, so this is the rare chance for me to choose (the food). Usually, we just eat what we have. If we do not have something, we just keep quiet... I am very happy to have this chance today."